The western corn rootworm (Diabrotica virgifera virgifera) is a devastating pest of maize plants, which has spread throughout Europe. This year’s pest monitoring in Germany revealed that the number of beetles caught in traps has again multiplied in comparison to the previous year. The insect originates from Central America, from where it spread invasively throughout North America since the 1950s. Agricultural authorities in the US estimate that the western corn rootworm causes damage worth billions of dollars each year. Plants deploy sophisticated defense strategies in order to fend off the many species of insects interested in feeding on their nutritious leaves or roots. 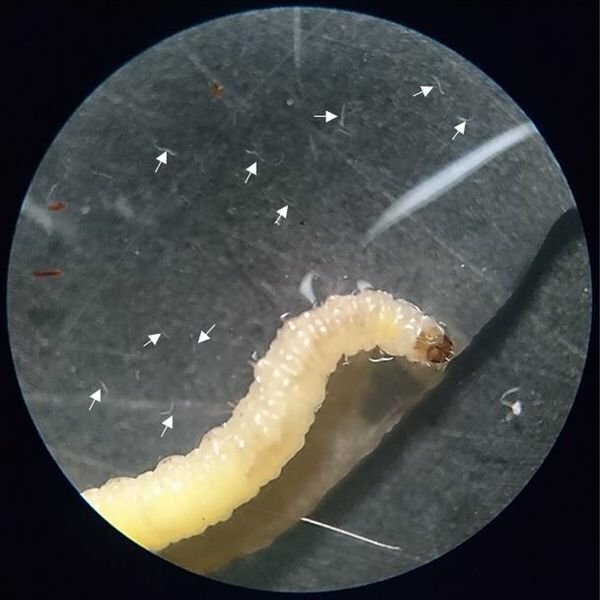 Researchers from Bern and Jena have now investigated the case of a beetle larva, which exploits the plant’s defenses for its own use. Maize plants store defense compounds known as benzoxazinoids in their roots in a non-toxic form. If herbivores attack the plants, these molecules rapidly break down into compounds that are toxic for most insects. “We were able to show that the western corn rootworm stabilizes a toxic benzoxazinoid by adding a sugar molecule. This modified molecule is used directly to keep nematodes, used as a biological control, away. Moreover, rootworms can stabilize a second plant-derived benzoxazinoid, sequester its non-toxic form in their bodies, and activate it upon nematode attack”, explains first and lead author Christelle Robert, who initiated this project in Jena and continued it at the University of Bern. 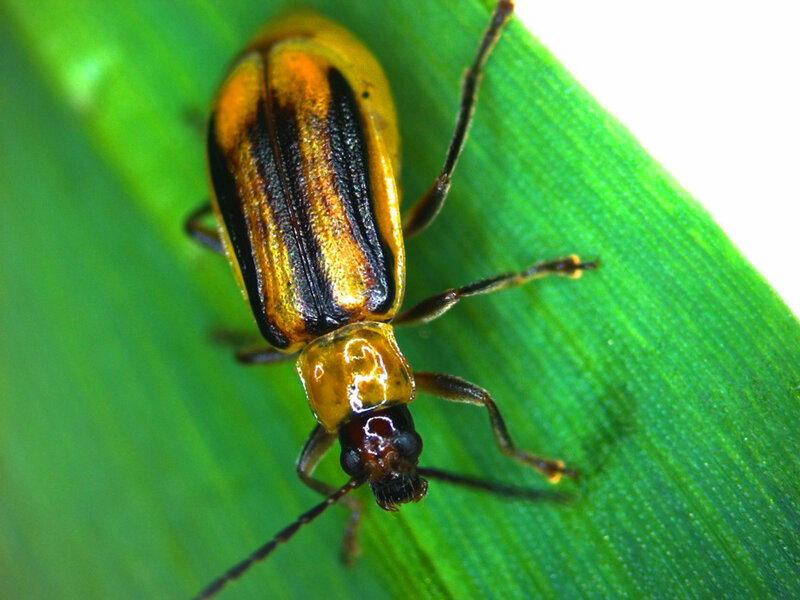 Hence, the rootworm once uses a double strategy to utilize plant defenses for its own protection. Biological control with nematodes once seemed a promising alternative to the use of chemical pesticides. Previous studies which involved scientists from the Max Planck Institute for Chemical Ecology had found that maize roots emit (E)-beta-caryophyllene to attract beneficial nematodes. 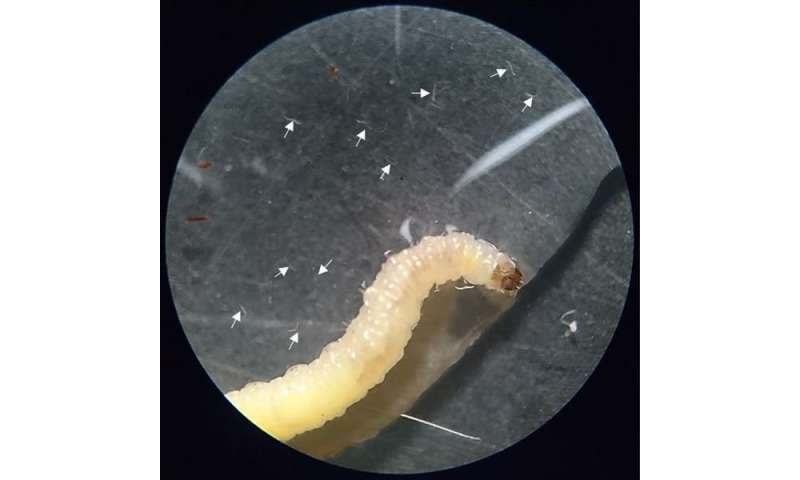 Entomopathogenic nematodes in the soil, like the beneficial organism Heterorhabditis bacteriophora, have the potential to invade pest insects where they secrete symbiotic bacteria. The bacterial partners kill the insect host and the nematodes proliferate in the cadaver. This seemed a reasonable strategy to combat the western corn rootworm. “Unfortunately, the nematodes often did not reduce Diabrotica populations very much, but it was not clear why this was the case. Thanks to the present work, we can now diagnose exactly why the biological control is inefficient. 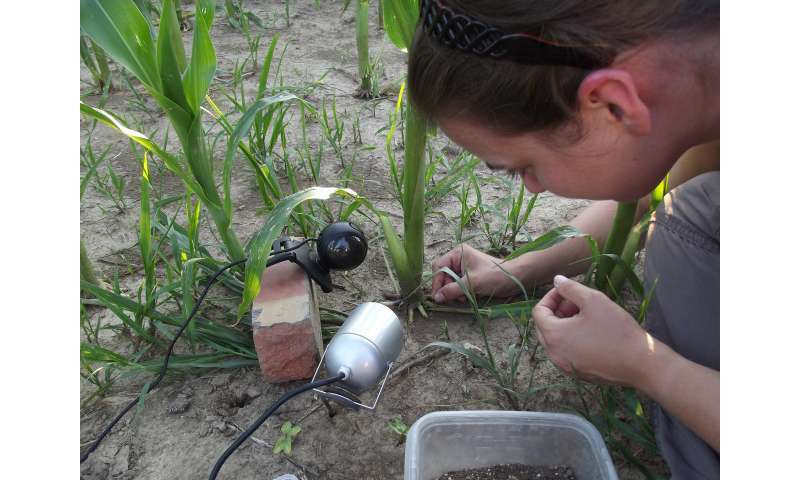 The rootworm is just too well protected with the plant’s own defenses. Another approach to controlling the rootworm is to breed maize for more benzoxazinoid defenses. According to the new findings, this will also not have much effect on Diabrotica because of their resistance to these chemical compounds, and even makes things worse by making Diabrotica more resistant to nematodes and possibly other biological controls,” Jonathan Gershenzon from the Max Planck Institute for Chemical Ecology summarizes. These unsuccessful approaches with biological controls and plants with high benzoxazinoid concentrations have left the scientists stuck between Scylla and Charybdis and show how difficult the rootworm is to control. 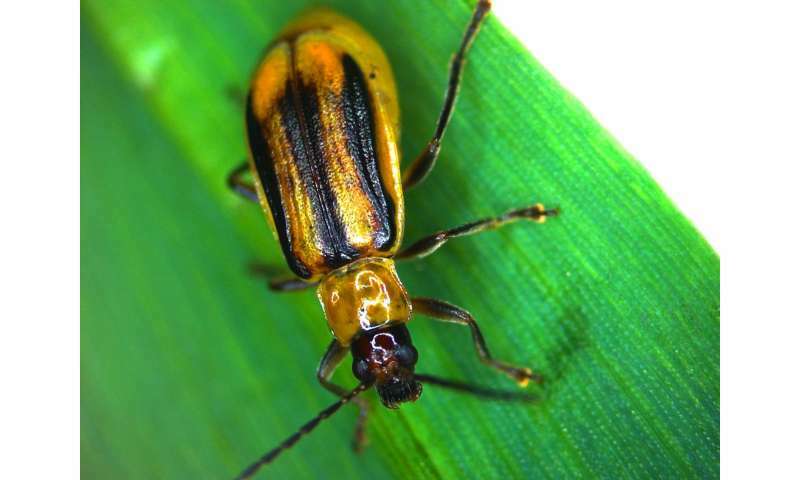 The scientists will now try to identify the genes or enzymes which enable the rootworms to outsmart maize defenses in order to ensure their own survival. Perhaps if these genes can be silenced, the rootworms will become susceptible to nematode infection. 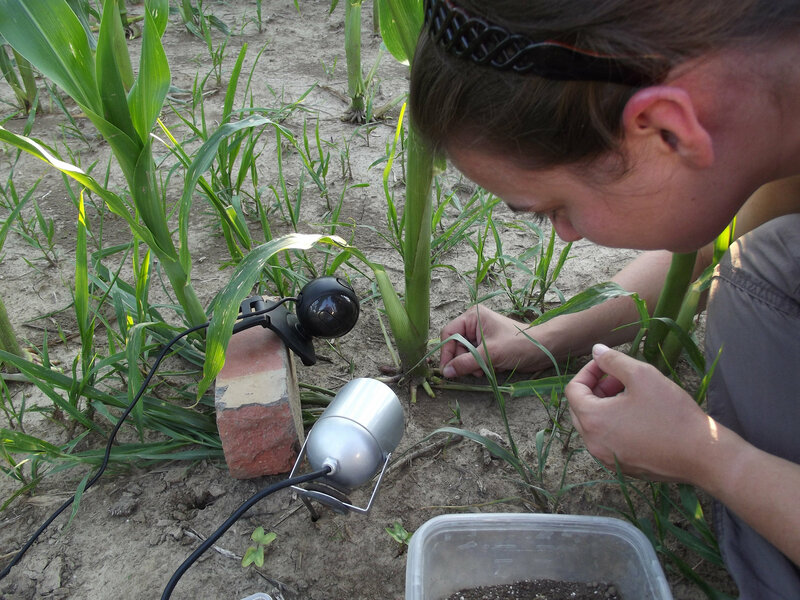 “Our work illustrates how a specialized and highly destructive maize pest has evolved the ability to utilize the major toxins of its host plant to escape predation by soil-borne natural enemies. These results provide an explanation for the limited success of biological control programs targeting the western corn rootworm”, says Christelle Robert. The study is an important basis for further investigations with the goal to improve the control of this major agricultural pest considerably in the future.